L.Gen. the Hon. 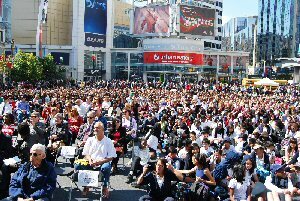 Romeo Dallaire (Ret'd) had a powerful message for more than 3,000 students from across the Greater Toronto Area and beyond attending the Friends of Simon Wiesenthal Freedom Day event at Yonge Dundas Square this afternoon. Speaking of the need for young people to help their peers in other countries who don't enjoy the same freedoms we have in Canada, Mr. Dallaire said, "you can change the world because you have the power to communicate and get engaged through modern technology. The challenge is to go and change the world," he said, advocating students should "get out there and get involved." Michel Chikwanine, a former child soldier from the Democratic Republic of Congo, echoed Mr. Dallaire's sentiments. "You are here today because you are free," he explained. "There are so many child soldiers in the world today who cannot speak up for themselves. I can use my story to mobilize young people to tell my story and to fight for the freedom we have in Canada." Jordan Banks, Managing Director of Facebook Canada and one of three co-Chairs of Freedom Day (along with Eric Weisz and Aaron Zifkin) noted, "When I look out at this beautiful crowd, I don't see in front of me a gathering of random teenagers. Rather what I see are the future Roberta Bondars and Romeo Dallaires... great Canadians who have championed humanity and integrity and equality both here and abroad... and today, they are you!" "Freedom Day is really all about teaching young people to use their voices to stand up against prejudice and oppression," said Avi Benlolo, President and CEO of Friends of Simon Wiesenthal Center for Holocaust Studies (FSWC). "One of the most important lessons Simon Wiesenthal taught us is the importance of speaking out against injustice and cherishing our freedom. We hope we have lived up to Toronto Chief of Police Bill Blair's statement when he addressed the crowd and said, 'Everyone can use a lesson in good citizenship and there is a good one going on today.'" Freedom Day is held on the anniversary of Holocaust survivor Simon Wiesenthal's death and was designed to highlight the Canadian values of democracy, human rights and freedom. To view the photo associated with this release, please visit the following link: http://www.marketwire.com/library/20110920-fswcfreedomday800.jpg. 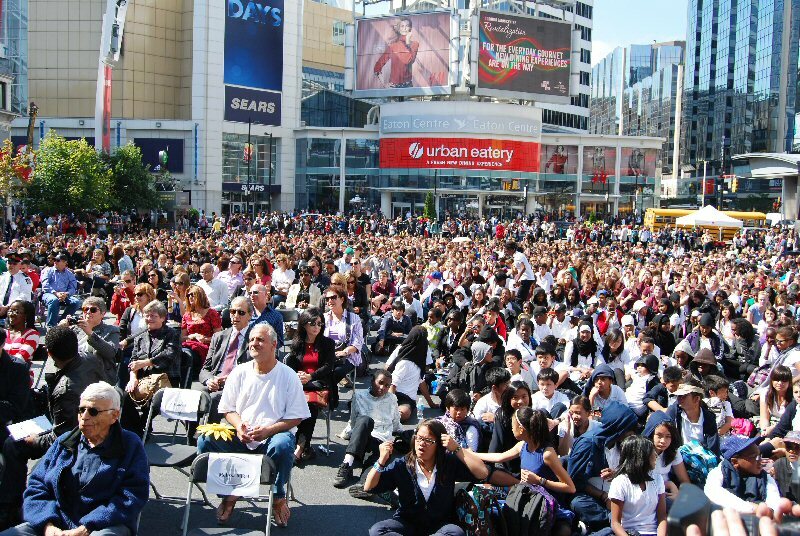 Thousands of students and their teachers from across the GTA attended Freedom Day hosted by Friends of Simon Wiesenthal Center for Holocaust Studies at Yonge Dundas Square in Toronto September 20, 2011.